Last year we went to Wales to stay with Nicole, Tim and the Twins, as they had a spare room in their holiday home but could only stay for three days. This year they were going to Cornwall, again they had a spare room and this time Dot could get the full week off work. Also good for this year, Tim had a seven seater car for the trip, with our topbox on and one seat down we had room for all of us plus all our luggage (at a push). We set off very early and the drive down was uneventful, although the M5 is very busy and very slow. My sciatica was a problem though, I was in constant pain for almost all of the journey, even though the doctor had given me a mix of stronger pain killers for the trip (the sciatica is also restricting the amount of time I can type this blog). I was glad to get out and walk off the pain as the others unpacked. We had planned to get breakfast on the way down but is seemed that every service area was stupidly overcrowded, one even had attendants directing the traffic in the car parks, something I have never seen before. So the first thing we had to do on arrival, was find somewhere to eat. We crossed over the river Fowey, had a quick walk around the main streets in the town and then called into the Globe Inn for lunch. They had three hand pulled beers on offer, including one I had not had (I will cover the beers in a separate blog so I can do them all together, although I will link to them). 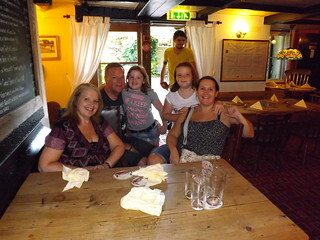 We all enjoyed our meals and the beer I got was very good as well. 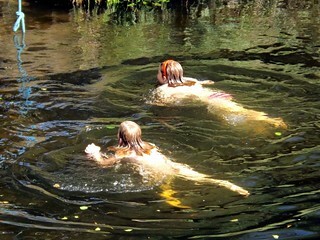 After lunch and later in the afternoon the girls went for a play in the river Fowey, they had seen other children playing in there. 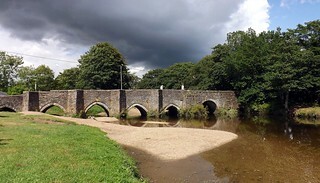 There is a small beach next to the old bridge (see the photo of the bridge above), that is perfect for the kids to play next to and in the river, although it disappears at high tide. Very tired, after showers, we had cheese and biscuits for supper and an early night.